I have been on the hunt for a Guernsey for a while now, a hunt which I was about to abandon as impossible — Guernseys are so hard to find around here, and expensive when you do find them. 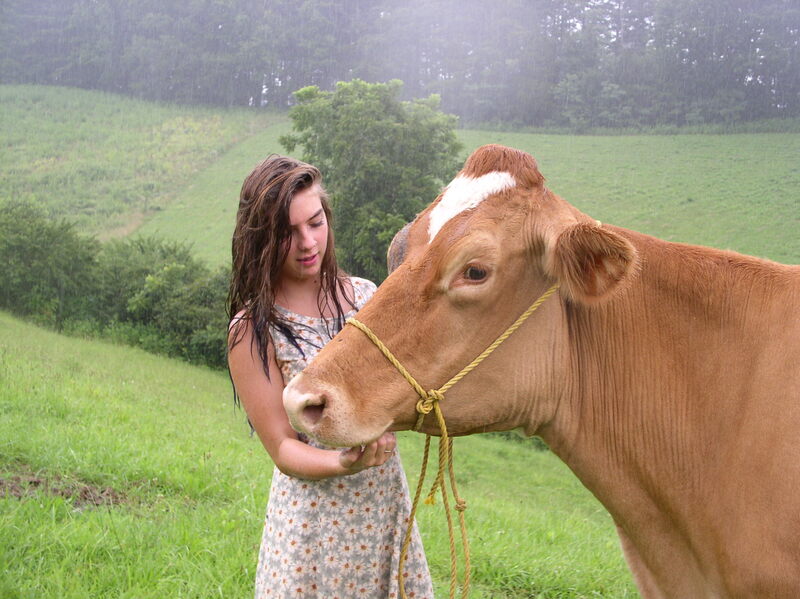 Of course, the moment I stopped looking, I got a call from one of my cow buddies who had a very nice four-year-old cow and was willing to make me a very good deal. Ellie May is such a big girl that we almost didn’t take her, but she is a sweetheart! Selena declared her an angel the moment they met. 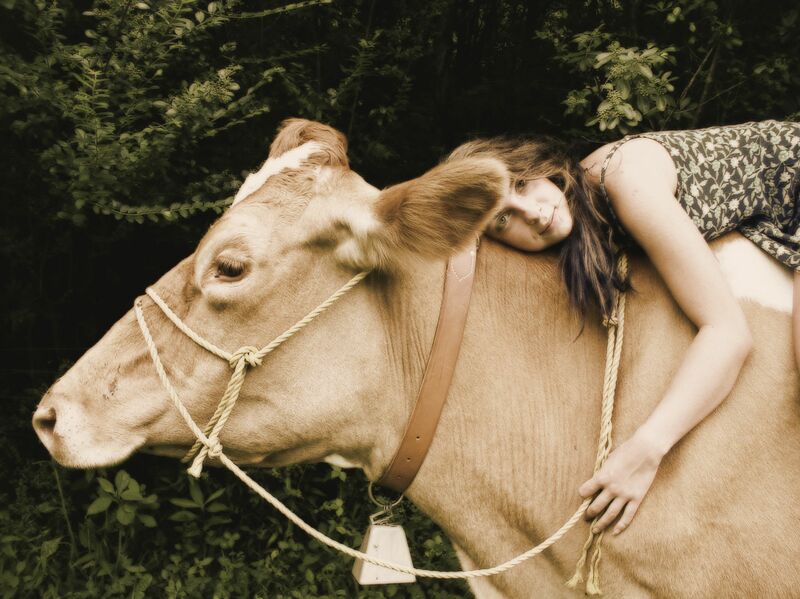 Ellie is due to calve this spring, and we are very excited to make some cheese with Guernsey milk! I have just been released from a day of haying, so I think I’ll take a minute to sit in the shade on the porch and introduce myself. My name is Terra, and I am the eldest of the Boss Lady’s two daughters. I suppose I am the head milkmaid. My sister does as much work as I do, but I like to think that I rank slightly in front of her, mostly because I am the one that always convinces the parents to buy more animals: only a HEAD milkmaid has that kind of clout. We have only ever had Nubians, so I decided to move away from those altogether, hoping that perhaps breed has something to do with our dislike of goats. 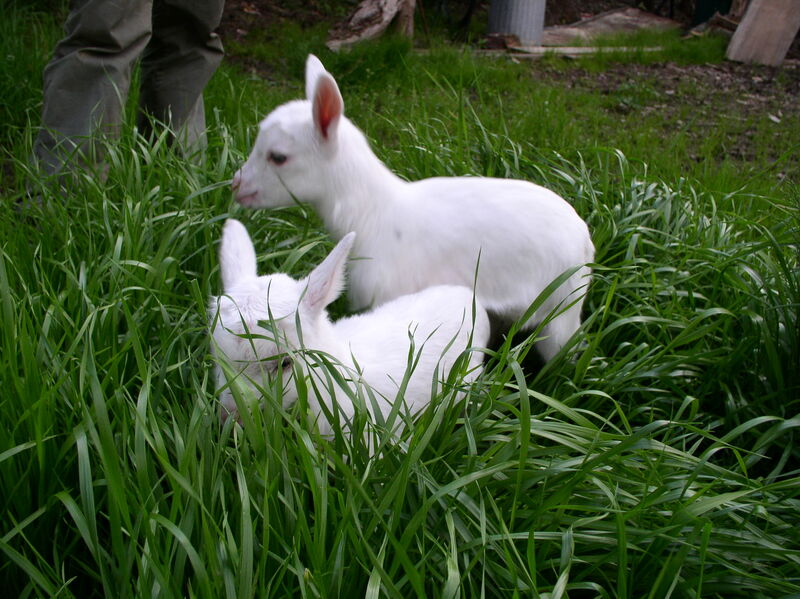 I have really liked the idea of Nigerian Dwarf goats. I liked the idea of shorter legs for reduced jumping ability, I liked the hardiness of them compared to the other dairy goats I’ve been around, and we really liked their butterfat. Trinket and Rhynestone (insisting that it be spelled with a Y). So I am hoping that these two pretty ladies will help me turn brush land back to pasture, help me feed orphan lambs, and give me lots of good milk next year! I love making cheese. There’s really nothing I would rather spend my days doing. Getting legal to make cheese is a whole different thing, though! Lately, market research, building design, septic systems—these are the things that fill my thoughts. I can’t wait to be messing around with the cheese itself again, which should be any day now.